Sometimes, you get what you pay for…free isn’t always good. I have spent countless hours fixing a problems with students that was ingrained during their previous training. I make a living correcting mistakes made by shooters on the range. Unfortunately, most of those mistakes are self-ingrained by doing repetitions with improper technique. Often times, the skill came from an invalid, “free” source that they found on the Internet. There are countless articles, blogs, posts, and videos on the Internet with so called experts teaching what they believe to be valid techniques. The unfortunate thing is that some are far from experts, and the bigger problem is that less experienced shooter might not know how to tell the difference. I have been sucked into the endless stream of information myself, and on occasion find that after getting sidetracked a dozen or more times, that I am not closer to the answer that I sought out. I hate that I have probably wasted two or more hours I could have spent practicing. So how do you validate the good from the bad? Look for instructors or sources of information that can be fairly easily validated. Most people that are really skilled at anything are usually easy to find, because they have been on the path of their particular skillset for years. They are easy to find, and often times easy to find things out about. Be careful about taking material away from an unknown source, ESPECIALLY when it comes to guns and gear. It seems like everyone out there is an expert, and it is hard to find objective information. Jut remember, you get what you pay for. Not everything you see on the Internet is true, valid, or should be the focus of your efforts. The guy has sick skill and speed. His drills are “crazy” dynamic and mimic real world concepts. His manipulation skills are incredible; each is refined by obvious hours of hard work. He has refined his index points and fundamentals to an incredibly high level. While most of the shooting he does on the videos is close range, I would feel pretty confident in saying that he is a very skilled shooter. He seems to be humble and does not promote flashy (although the videos come across that way, I assume because his company is good at marketing him). He makes several statements about “specificity” in training and how he focuses his efforts when he practices. This is critical information and an insight to how he focuses when he practices. He mentions safety, and the importance of it, as well as the fact that the stuff he shows needs to be trained before being tried. He demonstrates a solid understanding of close range fighting, and the dynamics of distance (when using a handgun). Watch how he does his post engagement scan/check. My point? That there may be a big difference in what you see on the Internet and do pay attention to, versus what you should be paying attention to in regards to training. I would love to train with Mr. Zero, but would do so because of what I would learn from him that would allow me to shoot better…rather than to just mimic something flashy I saw him do in an internet video. The majority of your training should be focused on shooting better. A full speed concealed draw process looks great in a photo! But if I can not manage the recoil, sights, and trigger I won’t hit anything. Good shooting skills begin there! The unfortunate thing is that I get students in my classes that have spent countless hours training, and some that have trained with several different instructors that still do not understand the fundamentals that will allow them to maximize their shooting abilities. The biggest thing I see students lacking is the inability to manipulate, and control the firearm they are shooting. In handgun classes they have very little idea of how to maximize their recoil control with a proper grip, and in a rifle class I rarely find someone who has really learned to control the rifle during fast shooting. Manipulation of the firearm is the second biggest area they lack skill in, whether it be performing a reload, or clearing a malfunction, often times I find those students lacking on skills that should be fundamental. In the beginning of your skill development during your own practice, or in any training class you take, if you are not learning or practicing something that will help you shoot better, you are on the wrong path. Every single training drill you do should have a purpose in your skill development. If you are attending an instructor led group class, then each drill your instructor gives you to do should have a purpose. Consider this, if you don’t leave each and every class or practice session a slightly better shooter, then why are you there? Now, for those that argue that defensive type instruction should include tactics and scenario driven learning experiences, I agree. But not at the expense of being able to hit the desired target, as quickly as possible! Don’t get sidetracked into tactics and games before you spend the time learning how to shoot. Educate yourself across several sources BEFORE you spend your money on guns and gear. Purchase with a purpose in mind. Just because author A, B or C says it is an awesome gun or holster does not mean that it will meet your needs. Get several opinions. We all have opinions. I have mine. In terms of selecting guns and gear, get several. Validate the source. Try the equipment before purchasing if possible. Most of the good ranges that sell guns have a rental program where you can rent a similar gun before buying it. Would you by a car without test driving it? Why buy a gun that might not work for you. Never, ever fight your gear. I have a common solution I give students when they show up to my classes with a gun that they are fighting, or gear that does not work; “throw it over the berm or in the trash.” Really, get rid of it!! If it does not work in class, what makes you think it is going to work in the real world?? When in doubt, follow the leaders. If you simply can’t decide on what to get, write or call several experts on the field and get them to give you their top three recommendations for guns and gear in the context you will be using them in. Look for the commonalities. Train with an expert early in your development, and at least once per year. I know, training classes are expensive. But so is ammunition and wasted time is invaluable. If you know anything about me, you realize that I offer training programs in the form of my books, and supporting DVD’s that a person can follow to greatly increase their skill. You know what I have found though? That students who attend my range courses that have read and gone through my completed one of my programs tell me across the board that they were missing something that they could not get from the book or DVD. It’s not that they did not like my material, just that I gave them a different depth of feedback when they trained in person with me. I try to take at least one course per year myself, and recommend you do the same. If you have one particular instructor you like, take their courses for a few years, but don’t be afraid to branch out. The training you receive, and what you do in practice must be focused on the context of what you are training for. This means that you must invest the most time practicing the skills you are most likely to use. It also means you must practice with the gear you will use in the environment you are likely to use the skill. Listen, the truth is that we all like to practice the stuff we are good at. And we also like to use the gear that is the easiest to do the best with on the range, which often times is not the same gear you might carry daily. I have made this same mistake myself. Look at the chart below to get some examples of what the average concealed carry holder might want to practice versus what they should be practicing to employ that handgun. A fast draw from a “range” holster without the normal shirt they conceal their handgun with. 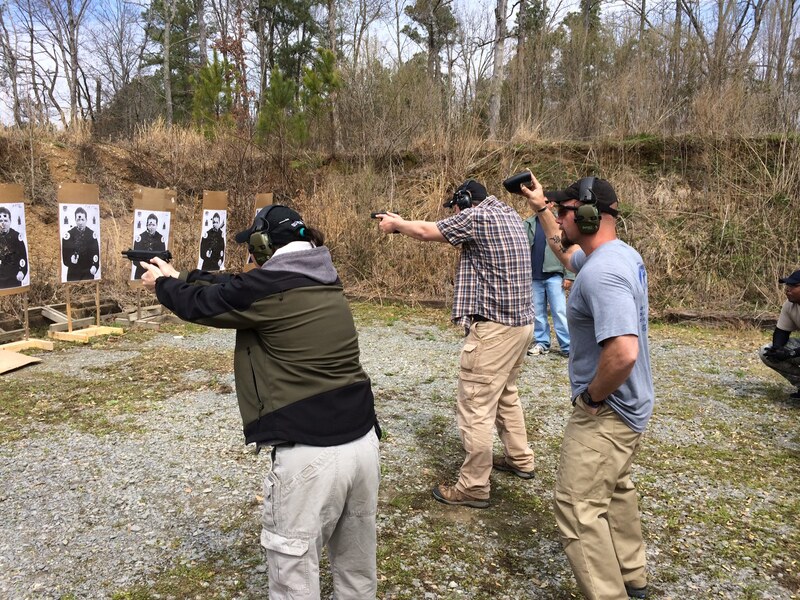 Executing a consistent draw from the holster they carry with and the concealment garment they wear while moving toward a piece of simulated cover. Drawing from real deal carry gear with the actual garment used to conceal the gun changes things. Doing it while moving adds another element. Or how about adding an obstacle to move around while you are drawing. How often do you think you will be attacked when completely alone? Moving around a loved one while drawing is a good skill that meets fits the context of where you operate. 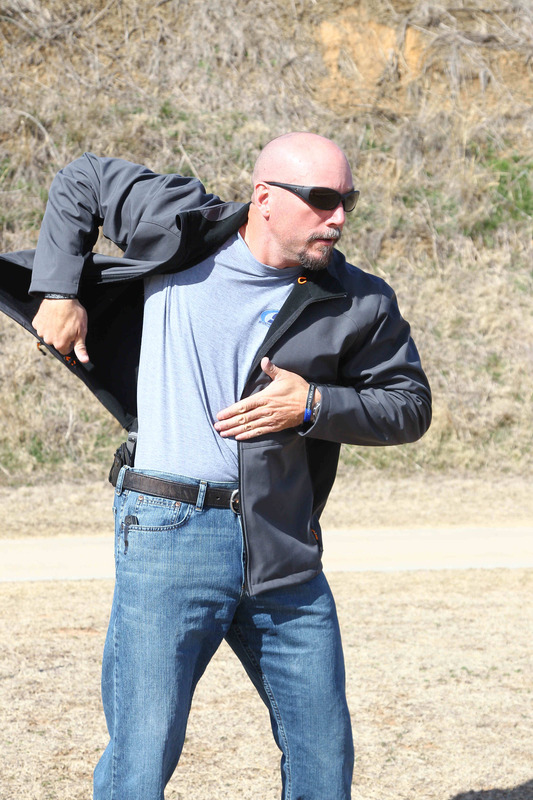 A static (flat footed) concealed carry draw using the support hand to clear the garment (during all of the practice session). Performing a consistent draw process with the strong hand only sweeping the garment (I actually teach the strong hand as the primary sweeping hand in YDHTP). The support hand is commonly occupied in believe it or not. Practicing one way that does not always meet the needs in a bad situation is a sure path to failure. Think about how common it might be to be in a parking lot with a flashlight in hand, or with your support hand holding hands with your young child when bad things happen. Both require the use of a one-handed sweep and draw process, make sure you practice them! Shooting really Fast “double taps” (I cringe at that word but use it in the purpose of this article). Recoil control with varying and multiple shots, a visual (and physical) follow through and assess process. You see, the good ole “double tap,” is a shot sequence that is used primarily in competitions. It was also taught in some circles who used to teach students to shoot twice and then assess. I disagree with this method, and history and literally hundreds of real world shootings teach us that it often takes more (and sometimes many more) than two shots to stop an attacker. Imagine shooting twice with a small, commonly carried pocket pistol (.380 acp), and hoping it stopped an axe-wielding attacker…only to find that it didn’t work. Not smart! Practice rapid, follow up shots and a visual follow through. Practice sessions should ALWAYS be approached with a purpose. 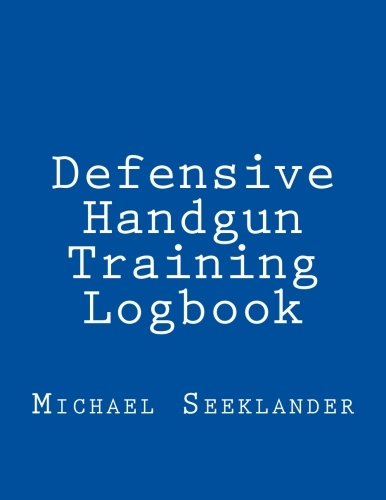 My Logbook documents my practice session, and allows me to plan my next one. Make sure you come to each practice session with a plan! so? I loaded up my gear, and went to the range to get some skills practice in….with no plan. Inevitably I would find myself putting a few drills together and then practicing the stuff I liked, versus what I really needed to work on. Another failing point is working on too many different things in one session. I have found that I have MUCH more success working on one or two skill areas, and repeating them until I have learned as much as possible from that drill. Most of my practice sessions start with some fundamental drills that on the fundamentals, and then I will pick a skill area to work on. Examples might be one handed shooting, or shooting while moving, or in tough shooting positions. Normally I like to have a drill that will allow me to watch my skill on an electronic timer, and measure the results. While not all defensive training is best done by just paying attention to times, the numbers still give me something to try to improve. In order to continue improvement, you must measure your skills. This one assumes you are already knowledgeable and skilled enough to take a test like my S-P Handgun Skills Test. If you are not at that level yet, then simplify the process and work on keeping your shots inside a certain area of the target. For example, if you are working on the fundamentals and you are a brand new shooter, you might spend an entire session working on managing the sights, trigger, and grip in a few simple drills. If you plan to shoot 100 shots during your practice session, you can count and track the number you hit in the scoreable area of the target (which ever target you choose). If you are in the military or law enforcement, you probably have a preset qualification that you can use to measure your skills. Why am I so adamant about measuring your skill? Simply because once you begin to focus on measuring something, you immediately boost your chances of focusing on improving that metric. Whether you use a notepad, electronic means, or maybe a pre-designed logbook (I designed one for each of my programs), make sure you are keeping track of your practice sessions. I like my pre-formatted books because they make it faster and easier to gather the data I like to follow up on. You are probably reading this post because you are a new shooter and have some goals you are trying to meet. There is no better way to help yourself meet those goals than to begin to log your training sessions, what you are learning in them, and the factors that you need to continue to focus on to help yourself improve. Believe me, I know it takes work, but a “systematic” approach to training beats a random one every time. So there you go, nine things you can really put to use if you are a new shooter and have an interest in really paying attention to your improvement. Remember, each one is something that I have personally watched shooters fail at. Make the choice to be the exception, rather than the rule. So SPOT on the mark! I see countless folks who are caught up in becoming Tactical Mall Ninja of the year and totally bypass fundamental basics of safe, effective gun handling. I tend to function on basics,,, very well refined basics. We can only hope that folks will heed your advice! Thanks for reading, and let me know how it goes! Excellent comments!! Thanks for reading, and commenting! Another well laid out article…I practiced more with an OWB holster as I was beginning my journey into the handgun world and now that I am more comfortable I need to begin to practice more with my real-world equipment, thanks for the reminder. I couldn’t agree more that it’s best to educate oneself and research around before purchasing any gun or ammo. This not only keeps you protected, but it can help keep your costs low, such as time, money, and stress, over time. Thanks for sharing!